https://i0.wp.com/www.bullmarketfrogs.com/wp-content/uploads/2015/04/Brindle_pied_frenchbulldog.jpg?fit=662%2C662&ssl=1 662 662 frogdogz http://www.bullmarketfrogs.com/wp-content/uploads/2015/06/bullmarket-logo.png frogdogz2009-02-25 16:09:172009-02-25 16:09:17London Animal Control - Overly Diligent Much? I’ve got a ton of new Solo photos for you to peruse, but I also have some sad news – Solo has gone over to the darkside. Living in a house full of cats has convinced him to join forces with the catnip licking, litter pan using axis of evil. Next thing you know, he’ll be up on top of the aquarium, staring at the fish. We’ll have to arrange for him to spend summer camps with Dexter, where he can re-learn such vital Frenchie skills as house peeing, toy stealing, dog wrestling and water dish tossing. Speaking of Dexter, he’s coming along quite nicely, although I still have days where I look at him and think “Pet?”. 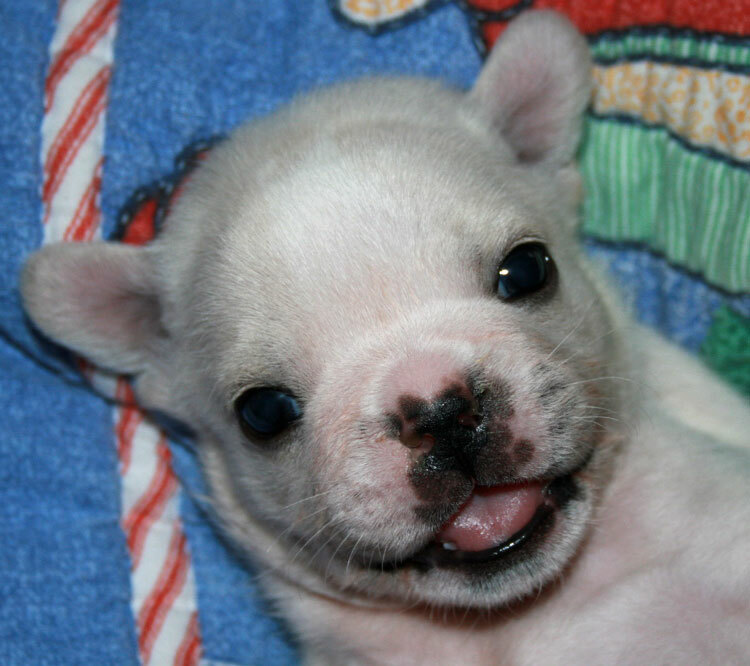 That’s typical of French Bulldog boy at this age, though – they’re all gawky paws and big legs and round goofball heads. Seriously, we should be able to send them away to boarding school at this point, and get them back as polished young gents, rather than the gauche little nitwits they are at four months. Here are some photos of him pretending to be a show dog. Barb despairs, because I haven’t yet managed to get him to stand on a table, but every time I try to he falls over into a pile of puppy goo. I’ll send him off for show training boot camp in a few months, and I’m sure he’ll toughen up quite nicely. In the meantime, I think show prospects benefit from exposure to all the sights and sounds that living in a crazed household like ours affords. Here’s a collection of some of the photos I’ve received of Frenchies with their new families. I have a ton more to add over the next little while, but I’ll probably wait til my beloved great white is back from the shop, because using the back up PC feels odd and alien to me. In the meantime, here’s a slide show of wicked, wicked Izzy wrecking the ever patient Linus’ birthday party. No wonder she gets left off of guest lists!